To offset the time-prohibitive delivery barrier, we, along with colleagues Marcel Allbritton, PhD, Michelle Wiseman, MPA, RN, and Tom Day, MA, developed and tested a 6-week cybermeditation program we delivered via email and a mobile app. The program included five 10-minute meditations (Calming, Nature, Nourishing, Spaciousness, and Releasing) grounded in the Krishnamacharya–Desikachar approach to yoga for healing known as yoga therapy.9 These meditations were tailored to address the work stressors of oncology professional healthcare providers. The meditations were designed to be effective in changing the state of the human system in the direction of mental focus yet also be accessible to individuals new to yoga and meditation and those with limited physical strength and flexibility. We conducted pre- and poststudies with 36 palliative/hospice professional healthcare providers who participated in the cybermeditation program.10 After completing presurveys, participants downloaded and used the cybermeditations: 1 new program used regularly throughout each week for 5 weeks, with 1 extra practice week. We conducted 3 follow-up focus groups and 1 in-depth interview. 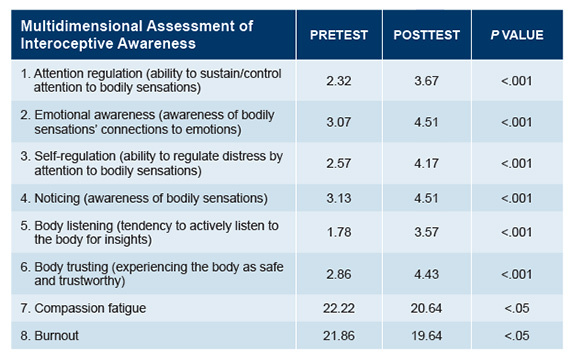 Results showed that the program motivated regular use, significantly improved interoceptive awareness, and reduced compassion fatigue and burnout (TABLE). Twenty-five percent (n = 9) averaged fewer than 2 meditations, 42% (n = 16) completed 2 to 4 meditations, and 33% (n = 13) completed more than 4 meditations per week over the 5-week period. Two-thirds (n = 24) reported being somewhat to very likely to continue using the app after the program ended. The study demonstrated effectiveness of the shorter length, portability, and convenience of the app and the brief informational and motivational support emails that minimized time demands compared with meditation interventions used in most studies. The cybermeditation program is scalable, optimizing both reach and efficacy and, once normed, can be adapted for other groups. Although scientific testing is still in early stages, the approach could potentially transform the delivery and effectiveness of meditation training programs for the healthcare industry. Carrie Heeter, PhD is a professor of media and information at Michigan State University. She designs and researches cybermeditation. She is a certified Viniyoga and meditation teacher. Heeter has studied meditation one-on-one for 6 years with Marcel Allbritton, PhD. Rebecca Lehto, PhD, RN is an associate professor at Michigan State University College of Nursing and a former oncology clinician. Her research focuses on symptom management and adaptation to cancer. Boyle DA. Compassion fatigue: the cost of caring. Nursing. 2015;45(7):48-5 doi: 10.1097/01.NURSE.0000461857.48809.a1. Back AL, Steinhauser KE, Kamal AH, Jackson, VA. Building resilience for palliative care clinicians: an approach to burnout prevention based on individual skills and workplace factors. J Pain Symptom Manage. 2016;52(2):284-291. doi: 10.1016/j.jpainsymman.2016.0002 . Back AL, Rushton CH, Kaszniak AW, Halifax, JS. “Why are we doing this?”: clinician helplessness in the face of suffering. J. Palliat Med. 2015;18(1):26-30. doi: 10.1089/jpm.2014.0115. Boyle D. Occupational stress in oncology nurse caregiving: caring for ourselves. Clin J Oncol Nurs. 2015;19(5):499-499. doi: 10.1188/15.CJON.499. Gómez-Urquiza JL, Aneas-López AB, Fuente-Solana EI, Albendin-Garcia L, Diaz-Rodriguez L, Fuente GA. Prevalence, risk factors, and levels of burnout among oncology nurses: a systematic review. Oncol Nurs Forum. 2016;43(3):E104-E20. doi: 10.1188/16.ONF.E104-E120. Sauter S, Murphy L, Colligan M, et al; National Institute for Occupational Safety and Health. Stress...at work. Centers for Disease Control and Prevention website. cdc.gov/niosh/docs/99-101/. Updated June 6, 2014. Accessed July 28, 2018. Back AL. How Contemplative Practice Infuses Clinical Practice with Serious Illness. Int. Symp. Contempl. Stud. [Internet]. Boston, MA; 2014. iscs2014.org. Sorensen G, Nagler EM, Hashimoto D, et al. Implementing an integrated health protection/health promotion intervention in the hospital setting: lessons learned from the Be Well, Work Well study. J Occup Environ Med. 2016;58(2):185-194. doi: 10.1097/JOM.0000000000000592. Chandrasekaran N. Principles and Practice of Yoga Therapy: A Complete Guide for Learning and Practice of Yoga Therapy. Chennai, India: VHP Publications; 2012. Heeter C, Lehto RH, Allbritton M, Day T, Wiseman M. Effects of a technology-assisted meditation program on healthcare providers’ interoceptive awareness, compassion fatigue, and burnout. J Hosp Palliat Nurs. 2017;19(4):314-322. doi: 1097/NJH.0000000000000349. Lehto RH, Heeter C, Allbritton M, Wiseman M. Hospice and palliative care provider experiences with meditation using mobile applications. Oncol Nurs Forum. 2018;45(3):380-388. doi: 10.1188/18.ONF.380-388.